I have been looking into the XCSoar Android app, and it looks like the XCSoar provide with much better quality of the map than LK8000 Android app does (Norway south). I have the the setting mountainous on both LK8000 and XCSoar. Is there a setting on the LK8000 to get the same quality? 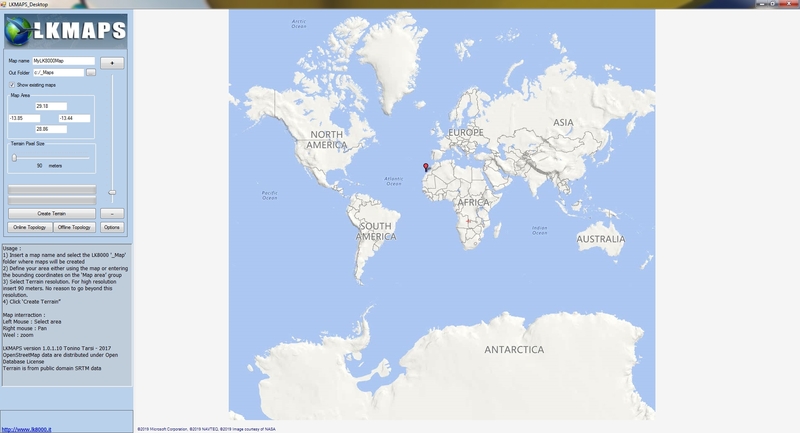 Version 1.0.2.00 is available and now we use http://viewfinderpanoramas.org as source website that have a mixed-source data that covers all the globe. What dataset is used beyond 60 N (and 56 S)? SRTM stops there as I understand it. Yes .. you are right. Bewonf 60 my tool run fine but data are 0 for lack of SRTM data there. Aster GDEM can be a solution there but be aware that GDEM has a lot of artifacts. Easier solution is to use LKMaps_Desktop that can produce maps everywhere (even > 60 deg .. I just produces Svalbard :-) ) in just 5 minutes. The first problem is that there is missing mapset area for my region in Norway (the northwest alps). The map is only reaching 1/5 of Norway from south to North. Do you know how to collect the complete mapset for Norway? However, to be able to test mapsetting I needed to find a random area with mapset. After creating terrain file 90m covering 50% Norway with LKmaps and tweaking the "mountanous" contrast/brightness settings 100/0 it got better. The filesize is 190mb. But IMHO the XCsoar map is more detailed showing the valleys and mountains better. See files to compare. I will not create a big subject around this, but I'm just exploring the potential. I am not any expert what so ever in this platform. Hi, that would be much appreciated. Please remember the lack of DEM data north of 60° N in the dataset normally used. This has been solved previously for Norway, I'm not sure how much effort it was. Did XCSoar solve this properly yet? For Norway there is only coarse maps avialable in the download section, but you can generate more detailed maps yourself as Tony mentioned above. @Tony: mayby we can generate some more detailed maps for scendinavia and add it for LKMaps? What do you mean with quality ? Any screen shot ?